Recently I have been using a colleague's computer to type traditional chinese using Monotype's MHeiHK-Light, -Medium, -Bold and -XBold. When opening MS Word 2010 (docx) documents written in PMingLiU (default traditional chinese font in Windows), and later highlighting all the text and changing to the MHeiHK fonts the spacing around the font is incredibly large causing a 1 page document to be reformatted to be 1.25 pages. Note that the line spacing is not changed, but the actual white space arount the font is changed - probably to do with how it has been made) Now my colleagues computer is running Windows 7, Office 2010 and using an OTF font format. Aside from manually adusting line spacing for each line of text to match PMingLiU - an incredibly tedious task to say the least involving many hours of guesswork, is there something I can do, becuase this problem is not apparent when using other foundry's donts nor in Illustrator / Indesign CS5 on Windows or any program on Mac OSX (Word 2011, AI, ID CD5.5) My Colleague and I jsut want to be able to type and everything is taken care of automatically - to create beautiful looking documents - simply. Aside from this, the final DOCX will be imported into Adobe Live Cycle Designer to create interactive forms (hence the need to use Word 2010 as PDF files imported to this program are a nightmare!!!). I would really appreciate any assistance with this one as Monotype are less than helpful. Hi all, Fron the screenshot attached it shows how the default microsoft font (PMingLiU) uses only very little space between lines, whereas the MHeiHK font is much more spaced. I have put underlining and captured the screenshot while selecting some text in this example to illustrate my point. On the right of the image (you may need to scroll), you can see the paragraph settings. Afrikaans (South Africa). Chinese (Taiwan). Chinese (China). Hebrew (Israel). MS Gothic UI. Japanese (Japan). MS Gothic UI. Thai (Thailand). Vietnamese: Arial. Vietnamese (Vietnam): Arial. For access to 3,000 fonts from the library on the web. Hand tuned for display. Access a broad-selection of painstakingly crafted fonts. It has been suggested that I set an 'exact' height for MHeiHK or indeed all text - this is fine, providing that I use only one typesize i.e. I create documents that fit certain criteria for visual design. Firstline headings are 50% larger than body text for example and I also use this font in conjunction with Latin fonts as the latin characters in MHeiHK and PMingLiU are horrible. Now having said that, I know that it is not the Latin fonts causing this situation, you can see from the examle of PMingLiU and MHeiHK sitting ont he same line that the MHeiHK sits slightly higher on the line, than PMingLiU and after typing the MHeiHK text the line space automatically increases but this is not actual line space from word, but caused by the font itself. This problem, does not however exist in Illustrator or InDesign, so it is something to do with how Word handles the font. Any suggestions as it is rather frustrating that I can not simply type document like I would with PMingLiU. I have a number of autoshapes that have text in them, formatted with bullets (*) and sub-bullets (-). All of the text is Arial and that's how I want it to stay. 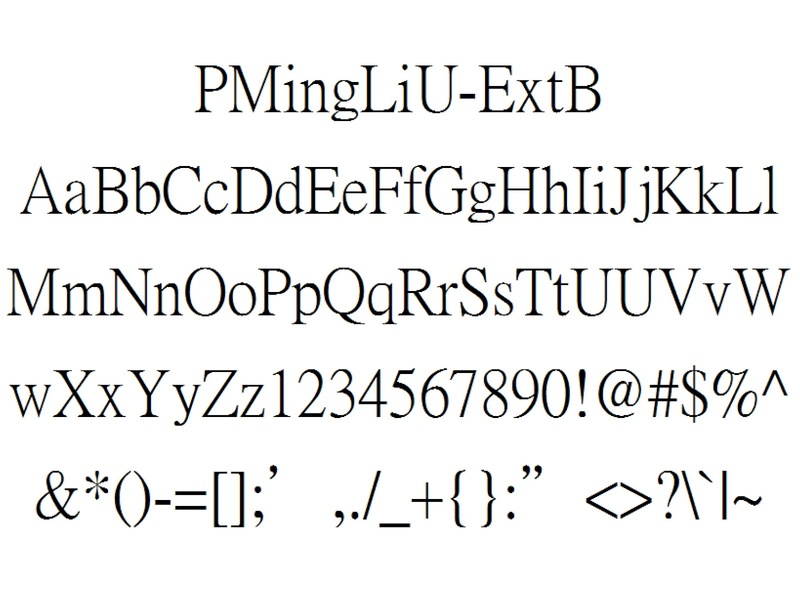 However, at the very last character, when I hit return to start a new line, Powerpoint gets confused and believes that 'PMingLiU' is the selected font. After I type a letter is reverts to Arial, but this is a problem because I want to distribute this file as a template and I can't have anything come back incorrectly formatted. I've now removed all foreign language fonts and manually deleted mingliu.ttc but it still is stuck. Can anyone help? - Dan Kathy J 14:39. Dan, Does it help to use Format-->Replace fonts and replace the PMingLiU font with Arial? -- Kathryn Jacobs, Microsoft MVP PowerPoint and OneNote Author of Kathy Jacobs on PowerPoint - Available now from Holy Macro! Books Get PowerPoint answers at Featured Presenter at PPT 2004 - I believe life is meant to be lived. But: if we live without making a difference, it makes no difference that we lived 'Dan' wrote in message news:0c6901c46e98$fdefc4d0$a401280a@phx.gbl. @powerpointworkbench.com Glen Millar 15:56. In article, Dan wrote: >I have a number of autoshapes that have text in them, >formatted with bullets (*) and sub-bullets (-). All of >the text is Arial and that's how I want it to stay. >>However, at the very last character, when I hit return to >start a new line, Powerpoint gets confused and believes >that 'PMingLiU' is the selected font. After I type a >letter is reverts to Arial, but this is a problem because >I want to distribute this file as a template and I can't >have anything come back incorrectly formatted. Position the cursor at the last character or even the next to the last character to make sure, then press DELETE a couple times. Retype any text you deleted if necessary. Save and see if that solved the problem for that text box. -- Steve Rindsberg, PPT MVP PPT FAQ: PPTools: ================================================ Featured Presenter, PowerPoint Live 2004 October 10-13, San Diego, CA ================================================ DANIEL RAICHE 12:22. 'Kathy J' wrote in message. >Dan, >Does it help to use Format-->Replace fonts and replace the PMingLiU font >with Arial? >>-- >Kathryn Jacobs, Microsoft MVP PowerPoint and OneNote >Author of Kathy Jacobs on PowerPoint - Available now from Holy Macro! Books >Get PowerPoint answers at >Featured Presenter at PPT 2004 - >>I believe life is meant to be lived. But: >if we live without making a difference, it makes no difference that we lived >>'Dan' wrote in message. >>I have a number of autoshapes that have text in them, >>formatted with bullets (*) and sub-bullets (-). All of >>the text is Arial and that's how I want it to stay. >>>>However, at the very last character, when I hit return to >>start a new line, Powerpoint gets confused and believes >>that 'PMingLiU' is the selected font. After I type a >>letter is reverts to Arial, but this is a problem because >>I want to distribute this file as a template and I can't >>have anything come back incorrectly formatted. >>>>I've now removed all foreign language fonts and manually >>deleted mingliu.ttc but it still is stuck. >>>>Can anyone help? >>- Dan >>DANIEL RAICHE 12:23. 'Glen Millar' wrote in message. >Hi, >>In addition to that, do you have Asian support installed for Office. If so, >do you need it? >>-- >>Regards, >>Glen Millar >Microsoft PPT MVP >>Please tell us your ppt version, and get back to us here >Remove spaces from signature >Posted to >>'Kathy J' wrote in message. >>Dan, >>Does it help to use Format-->Replace fonts and replace the PMingLiU font >>with Arial? >>>>-- >>Kathryn Jacobs, Microsoft MVP PowerPoint and OneNote >>Author of Kathy Jacobs on PowerPoint - Available now from Holy Macro! >Books >>Get PowerPoint answers at >>Featured Presenter at PPT 2004 - >>>>I believe life is meant to be lived. But: >>if we live without making a difference, it makes no difference that we >lived >>>>'Dan' wrote in message >. >>>I have a number of autoshapes that have text in them, >>>formatted with bullets (*) and sub-bullets (-). All of >>>the text is Arial and that's how I want it to stay. >>>>>>However, at the very last character, when I hit return to >>>start a new line, Powerpoint gets confused and believes >>>that 'PMingLiU' is the selected font. After I type a >>>letter is reverts to Arial, but this is a problem because >>>I want to distribute this file as a template and I can't >>>have anything come back incorrectly formatted. >>>>>>I've now removed all foreign language fonts and manually >>>deleted mingliu.ttc but it still is stuck. >>>>>>Can anyone help? >>>Thanks! >>>- Dan >>>>>>DANIEL RAICHE 12:25. In article, Daniel Raiche wrote: >I've tried deleting the end of the line, the ending text, and all of the >text. No matter what I do, after I type a line and hit enter, the Font >dropdown selector shows 'MingLiU' until I type the first character, when it >switches to Arial. If you want to email me a *SMALL* version of the presentation, perhaps just one slide that demonstrates the problem, I'd be happy to have a look. Steve at-sign pptools dot com If you can't get it down to a meg or two max, don't email it; it'll get rejected or deleted, one of the two. >>So unfortunately I think I'm stuck! >- Dan >>>'Steve Rindsberg' >wrote in message >href='news:VA.00000804.9f5bdaa1@localhost.com.>>In article >, >Dan wrote: >>>I have a number of autoshapes that have text in them, >>>formatted >with bullets (*) and sub-bullets (-). All of >>>the text is Arial and >that's how I want it to stay. >>>>>>However, at the very last character, when I hit return to >>>>start a new line, Powerpoint gets confused and believes >>>that >'PMingLiU' is the selected font. After I type a >>>letter is reverts to >Arial, but this is a problem because >>>I want to distribute this file as >a template and I can't >>>have anything come back incorrectly formatted. >>>>Position the cursor at the last character or even the next to the last >>>character to make sure, then press DELETE a couple times. Retype any text >you >>deleted if necessary. >>>>Save and see if that solved the problem for that text box. >>>>-- >>Steve Rindsberg, PPT MVP >>PPT FAQ: href=' >>PPTools: href=' >>================================================ >>Featured Presenter, PowerPoint Live 2004 >>October 10-13, San Diego, CA >href=' >>================================================ >>>-- Steve Rindsberg, PPT MVP PPT FAQ: PPTools: ================================================ Featured Presenter, PowerPoint Live 2004 October 10-13, San Diego, CA ================================================. File Scavenger 4 3 Keygen Crack. Attention, Internet Explorer User Announcement: Jive has discontinued support for Internet Explorer 7 and below. In order to provide the best platform for continued innovation, Jive no longer supports Internet Explorer 7. Jive will not function with this version of Internet Explorer.